When Kari Castle was a little girl, she had a recurring dream about flying over her neighborhood like Peter Pan, landing and taking off at will. Today, to see Kari Castle in flight is to understand that dreams can become reality. You clap your hands and believe. Castle is the most decorated woman in hang gliding, and she is the first and only woman ever to qualify for the U.S. National Hang Gliding Team. So far, she has accumulated fourteen U.S. National Championships and three World Championships, plus a Canadian National Championship and several state, national, and world records. Not content to dominate in only one field, she’s also won multiple U.S. National paragliding titles. And although this athlete has already proven that she can take on the best – women and men – Kari Castle thinks there’s nowhere to go but up. Castle was born in Royal Oak, Michigan, in 1960, and she got her first taste of hang gliding in 1981. She was a natural in the air. For a while, Castle stuck to a 9-to-5 job to cover her expenses, but eventually she moved to Bishop, California, to pursue her “flying addiction” full time. 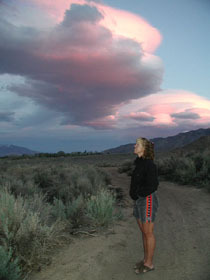 Just as Castle mastered the Owens Valley, she also mastered her competition in contest after contest. She won the very first U.S. Women’s National Hang Gliding Championship she attended, in 1988, and thirteen more U.S. titles came fast and furious. In 1996, she captured the first of her three Women’s World Hang Gliding Championships. But women weren’t her only rivals. Many high-profile hang gliding events welcome athletes of both genders, as long as they survive the rigors of qualifying. In 1993 Castle made headlines when she became the first woman in history to win a major competition (the Sandia Classic) over a mixed-gender line-up, and when she entered the Canadian Nationals in 1995 – the sole woman in a field of elite men – she won the gold there, too. Meanwhile, Castle had also taken up paragliding in 1988. “I was ready to try something new, and hey- it flew, didn’t it?” Castle laughs. 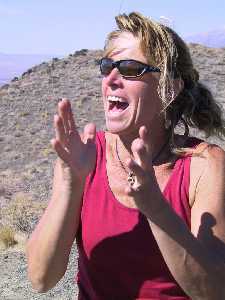 She was crowned U.S. Women’s National Paragliding Champion in 1995, 2001, 2002, and 2003. As a warm-up of sorts, in April 2004 Castle set a new Florida Women’s Distance Record (202km/125.5mi) in hang gliding at the Flytec Championships – where she placed sixteenth overall, third among American pilots, and first among female pilots. After more than twenty years of being a cross-country queen, can Kari Castle really hope to succeed at aerobatics?